The moulding plants in a cold resin (hand) moulding shop link the individual work steps of moulding, from filling and compacting to casting to demolding of the casting. In contrast to the classical base molds, the workflow is controlled in scheduled, plannable work steps. 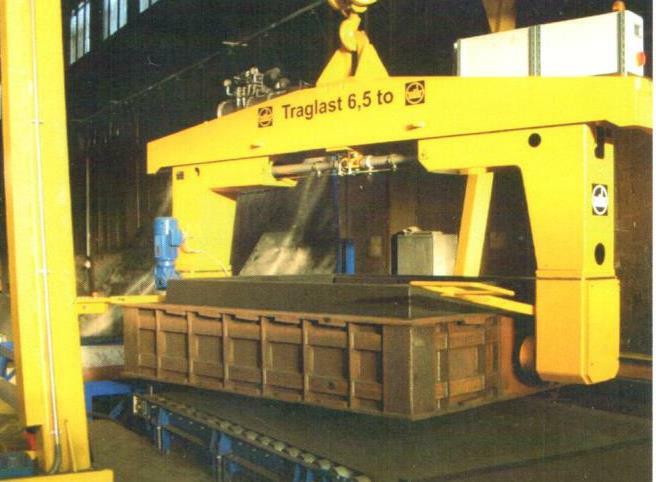 The transport tasks required in the production of molds are performed by the plant without the necessity of operator intervention (Fig. 1). In particular the principle of chaining has to be respected in the planning phase so that the required performance can be achieved. The plant's success is based on the uniform performance of each single work station. Continuous rotary mixers are the central component in the model circuit (Fig. 2). Depending on the size of the molds, the required throughput is determined. The quality of the moulding material mixture and the process reliability of the plant should come first here. The curing time can be kept nearly constant by selecting the binder system in combination with a powerful dosing control. Optionally automatic filling programs can be applied, which allow for quick and uniform filling of the mould. A vibrating table serves for the mechanical compaction of the moulding sand at the filling station (Fig. 3). 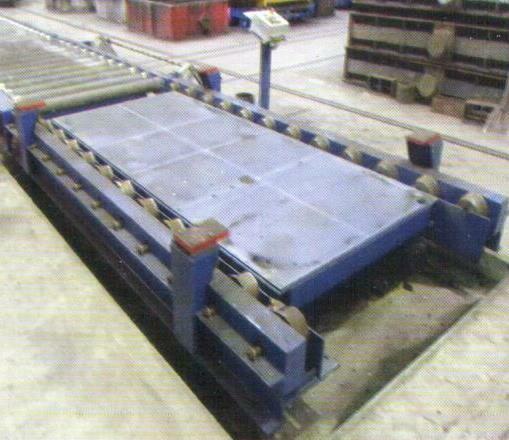 This is a platform which takes the mould on the model disc carrier when the roller table is lowered. The platform stands horizontally and vibration-isolated on rubber springs. Below the platform there are unbalanced vibrators installed. These create vertical vibrations which make the mixed moulding sand flow. It distributes evenly in the mould and compacts. Roller conveyors (Fig. 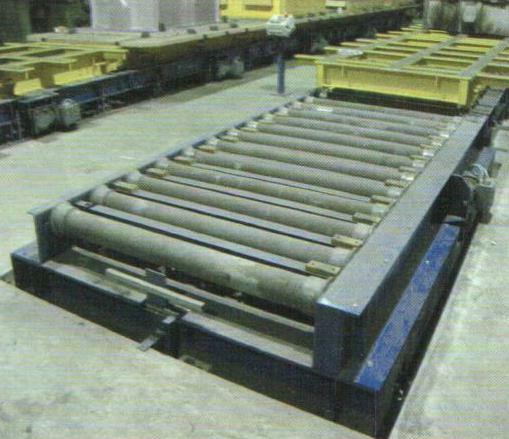 4) and band conveyors serve for the transport, buffering, and storage of transport pallets and moulding boxes. During model preparation, filling and hardening of the mould, these processes are coordinated by a control system. 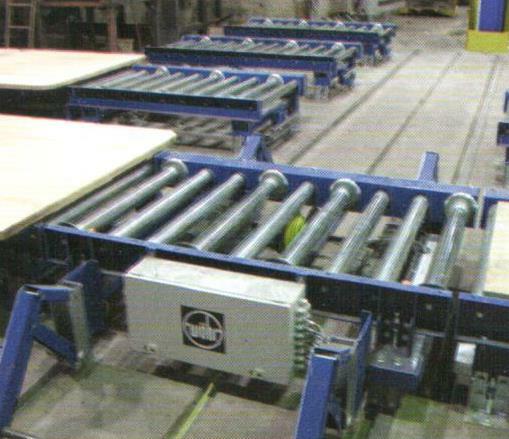 To change between moulding lines, transfer cars are fitted with roller conveyors or band conveyors are used. The transfer car can be controlled either via a cable drum or a radionetwork. A pin lift-off station (Fig. 5, AAGM Aalener Gießereimaschinen GmbH) is an effective and cost-efficient appliance for quick and secure separation of model and mould. It includes a lifting unit which rises parallel and horizontally. The steel pins inserted in the model frame are thus pressed upwards. The steel pins act on the moulding box frame or sand surface and press the mould upwards out of the model. This solution ensures plane-parallel lifting of the mould and that the sand mould is not damaged when being separated frame the moulding box. 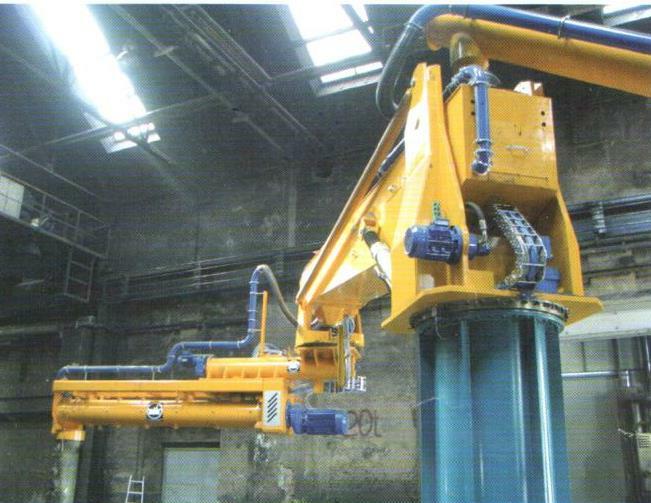 Lowering turners provide the option to remove molds automatically from the model. The cured mould enters the turner. A transport pallet is pressed on it frame above. The turner then turns by 180°. The transport pallet lowers slowly and moves the mould Iying on it out of the model. The function of a lowering turner can be realized with a "gym wheel" turner (Fig. 6) or a C-turner. For the handling of mould bodies and moulding boxes, various manipulation devices are required for secure and efficient manipulation (Fig. 7). 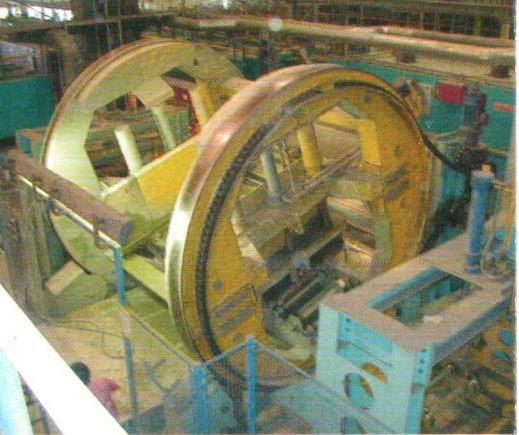 These are characterized by a large width variance and are provided with hydraulic center-of-gravity shifting. The horizontal position of the body / box can thus be set easily. Frequency-controlled rotary drives apply the required torque via worm gears. In the compact controller, all parameters can be set and visualized. Coating is usually applied after separation and post-curing of the mold. In the case of higher production rates and in order to achieve uniform coating thicknesses, the mould is flooded. It can provide coating stations (Fig. 8) for alcohol- and water-based coatings. 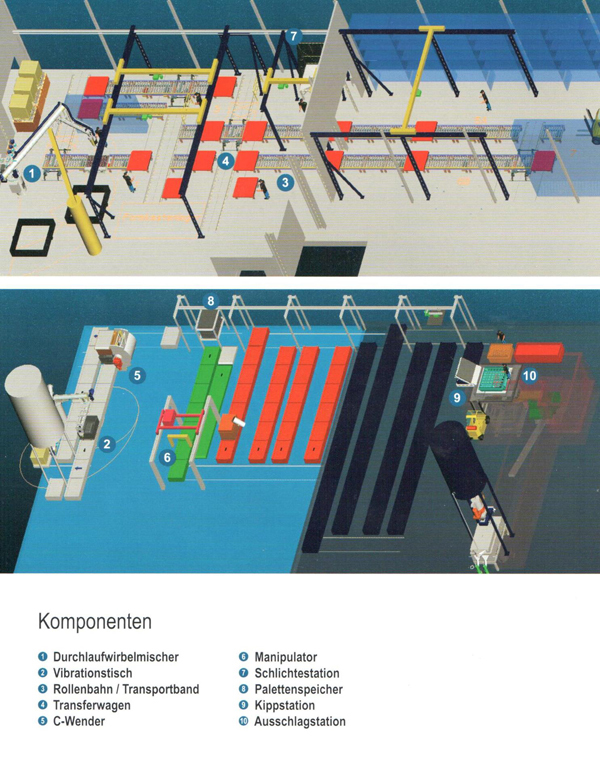 According to customer-specific requirements, various special solutions can be integrated in molding plants:Pallet storage tower Automatic model high-bay racking Special means of transport (lifting transfer cars, battery transfer cars, roller conveyors with conveyor belts) Teach-in filling process Tilting station at the shake-out grid.